The Farmhouse Obsession: Autumn Saison - Pumpkin Saison??? Autumn Saison - Pumpkin Saison??? It is HERE!!! Pumpkin mania is here and everywhere you look pumpkin beers, pumpkin spice lattes, and pumpkin everything is everywhere you look. I'm going to fuel the fire with another pumpkin beer. This time though I'm going with a pumpkin and butternut squash Saison. Lighter on the spices and more on the squash flavors. I used to love pumpkin beers. I got excited every year and would always stock up. Now I tend to avoid them as they all seem to mesh and become the same beer. Nothing really exciting comes out. 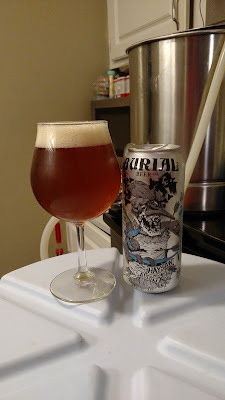 Jolly Pumpkin's pumpkin sour, La Percela, is one that I will try to pick up each year but it it is totally different than most of the pumpkin beers that come out each year. There may be a few other examples but for the most part I'll have a few Pumkings and I'm good. I developed the below recipe as a base for my squash Saison. I brewed this on 9-25-15. 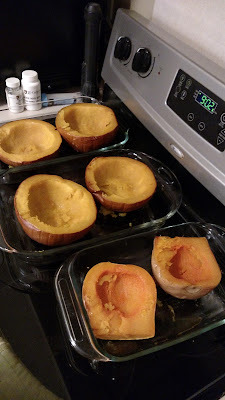 Notes:  Added baked flesh of two pie pumpkins and one butternut squash to the mash. at the end the boil. Back in 2013 I had the idea to do a pumpkin beer with a Belgian Dubbel. Everything went great except that the beer fermented down to 1.004 or so leaving no residual sweetness at all. I'm hoping the grain choices will leave some sweetness there for the beer to have balance and drink a little easier. Got to drink Saison while brewing Saison. 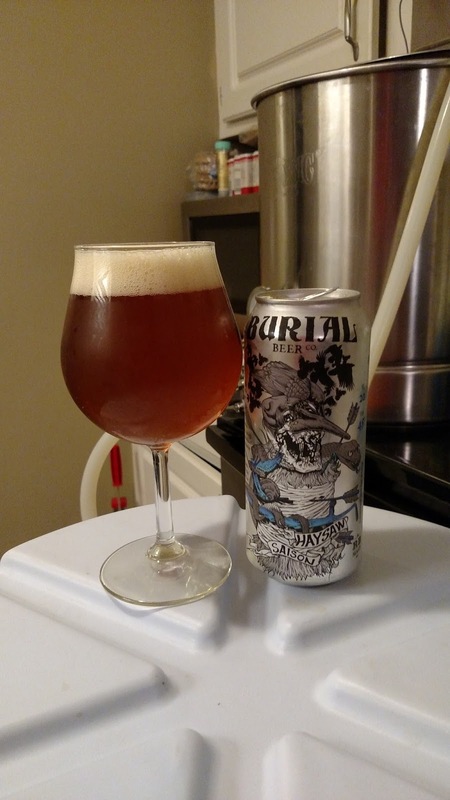 This was a great offering from Burial Beer Co. Nice and dry while being a little malty as well. Great fall Saison IMO. I've been wanting to use Golden Naked Oats in a beer and I've got about 15# of the Golden Promise laying around needing to be used. I'll brew this again before the year is out if it turns out well. I can always use them in another brew if this isn't to my liking. This will also be my first brew with Wyeast 3725 Biere de Garde yeast. It's been reported that this is actually Fantôme's Saison yeast and not an actual Biere de Garde yeast. The description really fit the bill of what I was looking for and I grabbed a few Smack Packs this year so I figured an Autumn Saison would be nice. I cut the pumpkins and squash in half then quartered the squash. 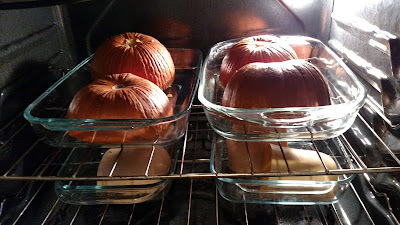 I roasted them in Pyrex dishes at 350F for an hour. I ended up putting the top half of the butternut squash back in for about 15 minutes to soften it up more. After they cooled I scraped the flesh from the skins and set it aside in a bucket. When I doughed in the mash I added a bit of water to the pumpkin and stirred it to blend it all together. I added to the mash and let it equalize. My mash temp ended up right at 153F at the beginning and fell to 150F by the end. Roasty! Disregard the terribly dirty oven, I'm due a cleaning! My house smelled like Thanksgiving! Pumpkin and butternut squash innards. 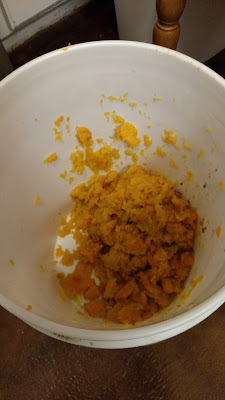 The mash was tough, of course, with all the pumpkin and squash in there. I ended up using 1/2lb of rice hulls at the beginning but had to add another 1/2lb when I started the first sparge. Plus, I believe the Golden promise was almost a year old. That and the pumpkin really played with my efficiency. But in the end I hit a nice number for this beer that I'm happy with. Moving to my new system I'll be able to dial in my efficiency much more. With my pot and cooler I've been averaging 65-75%. Boil process was normal and I added my spice combination of .5 teaspoon of all spice, ..5 teaspoon of cinnamon, and .5 teaspoon of ginger. with 5 minutes remaining. I left out the nutmeg and clove as I was wanting some of the saison yeast spice to shine through. I added one pound of light brown sugar after I turned off the burner. I left the wort for about 10 minutes while the spices steeped. 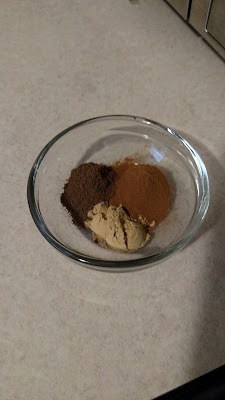 I went a little lighter on the suggested spices and took out a few as well. I wanted the all spice, cinnamon, and ginger but I wanted the Saison yeast to do the rest. I cooled the wort to 75F and set my fermentation chamber to 68F. 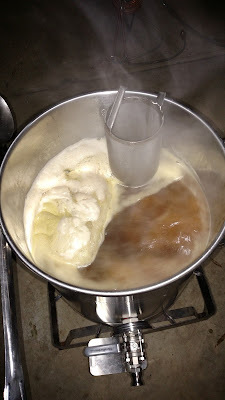 The day before brewing I made a 1000mL starter and I pitched that while it was still showing a bit of activity. The wort tasted amazing and smelled very nice. I know some of the spice characteristics will be driven off during fermentation and honestly, I'm counting on that. I've been playing with the idea of adding bretta to some portion of this. I think the RVA Orchard Brett would be great in this. I may try that out. During bottling I'll pull off 2.5 gallons or so and add the bretta to it and let it work. We'll see closer to time. I'll post updates as the process moves along. 9-26-15: 7:30AM the beer had full krausen going. Really white krausen with a bit of brown speckled around. Airlock did have activity but I tightened the top down on the Big Mouth Bubbler and there was more bubbles then. That's something I'm noticing on these. You can tighten it but over time it seems it slips. During fermentation I have to tighten them a few times before the seal sits completely tight. This may be due to the StarSan I use to sanitize the lid. After it dries fully it tends to seal better. Just something to be aware of for those who have purchased. I plan on using these as my open fermenters for my clean saisons. Nothing for extended aging as the pellicles that are formed in it are monstrous. It has to be letting O2 in. 9-29-15: Bulk of fermentation looks to be complete. Still a small layer of krausen and a few bubbles every now and then. I plan on taking a gravity reading this Friday. I'll let the beer mellow and completely finish for another week probably if the gravity is not stable. 10-10-15: Pulled sample and the gravity was 1.010 down from 1.060. It tastes really great but there was some yeast still in suspension. I'll look again in the next week and see if it's ready to bottle. 10-12-15: Gravity was down to 1.006. 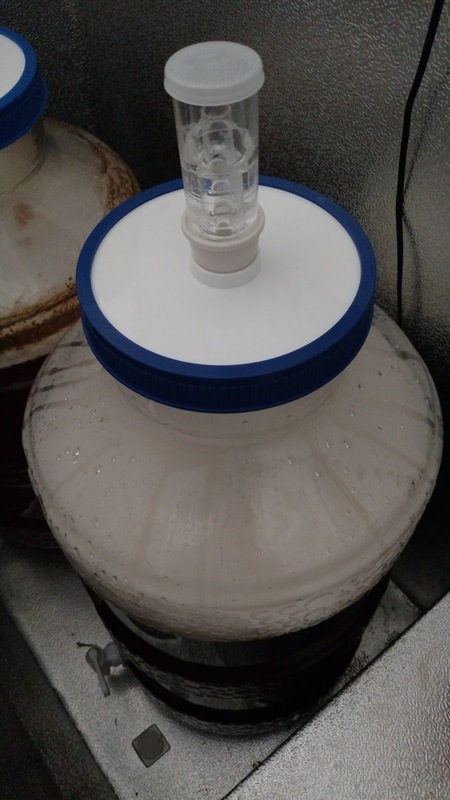 10-16-15: Gravity stable at 1.006. Bottled with 4oz table sugar.